First T20I, Bangladesh vs Afghanistan. Result : Afghanistan won by 45 runs. 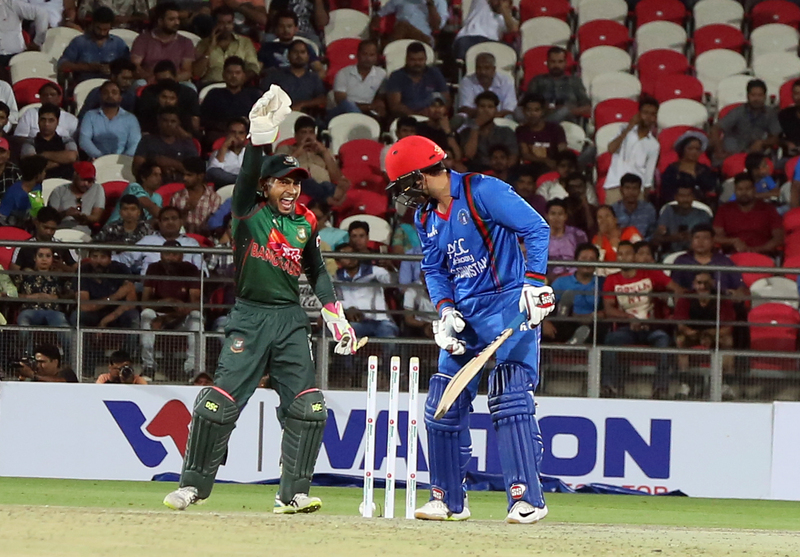 Bangladesh started the T20I series against with a 45-run defeat against Afghanistan at Rajiv Gandhi International Cricket Stadium, Dehradun, India. Shakib Al Hasan won the toss and opted to bowl first. Shahzad and Usman gave Afghanistan a flying start with a opening partnership of 62. Rubel got rid of Usman on 26. Then Mahmudullah’s two-wicket over put Bangladesh in a driving position. But some power hitting from Shenwari and Shafiqullah helped Afghanistan to post 167 for 8 in 20 overs. Shahzad was the top scorer with 40. Mahmudullah and Abul Hasan shared two wickets each. Chasing 168, Tigers had a nightmare start as they lost Tamim Iqbal in the first ball of the innings as Mujeeb trapped him lbw. Liton Kumar and Mushfiqur Rahim made an 43-run stand in the third wicket. Liton was dismissed after scoring 30 off 20 balls. Then Rashid Khan took the wickets of Mushfiqur and Sabbir Rahman in the 11th over. Mahmudullah’s 29 run knock was not enough Bangladesh were eventually bowled out for 122 in 19 overs. Rashid Khan and Shapoor Zadran shared two wickets each. Second match of the series will be held on June 7 at the same venue.